Baby monitors are a key addition to nurseries and kids’ bedrooms that make sure parents always have eyes and ears on their bundles of joy. 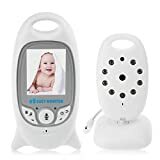 Choosing a good quality baby monitor is essential to maximize peace of mind, but with so many available models out there it can be easy to make the wrong choice. Never fear, Comparaboo understands how important it is to make a smart baby monitor choice. 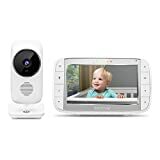 With that in mind, we have put together this comprehensive baby monitor shopping guide with all the advice and tips you need to find the perfect baby monitor for you. 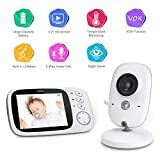 Video Baby Monitors: These monitors allow you to not only listen to your baby while sleeping but watch him as well. With a host of add-on features that include zoom camera functions, screen variety, and night-vision, they provide complete monitoring. 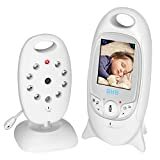 Audio Baby Monitors: Audio baby monitors are economical monitors that allow parents to listen to their children when they are out of the room. They are a popular choice among consumers and offer good listening security. They are also smaller, which makes them less obtrusive and more portable for travel. Movement Baby Monitors: Movement monitors includes a sensor with their transmitter and receiver, which is put under the baby’s mattress. It monitors sound as well as movement and breathing, and if the baby has stopped either for 20 seconds, a small alarm will sound, alerting parents. Designed particularly for babies with health issues, they add a lot of comfort to parents. Analog Baby Monitors: These baby monitors transmit their signal as radio waves and are the most cost effective option. An ideal choice when you have limited devices that may cause interference, a smaller quieter home, or for people on a tight budget, analog monitors provide peace of mind for less. Digital Baby Monitors: These baby monitors convert sounds into data, offering more security and good sound quality. With a lot of models offering encryption that is able to further limit interference, the neighbors won’t be picking up your signals and your monitors will not be picking up theirs, meaning no distractions to keep you from missing your baby waking up. 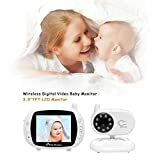 Wireless Network Monitors: Normally video monitors, these baby monitors are able to send video and audio through the home’s Wi-Fi network to a laptop or devices like tablets or smartphones. This kind of monitor allows parents to check in on their children’s rooms and baby nurseries while out of the house when are left with a childminder or family member. Operation: Baby monitor owners value their units based on how easy they are to operate, and ones that measure up are rated well. Things like intuitive user-friendly menus, long power cables for corded monitors, and batteries that come in standard shapes for easy replacing and charging are all factors they note for improved operation satisfaction of their monitors. Range: Range is an important reviewing point and owners of baby monitors that have longer ranges rate their units much higher than those that don’t. Longer ranges are especially important for larger homes so that you won’t lose sound and video quality at further distances, and looking for a long range model will ensure much more pleasure with your purchase. Audio/Video Quality: Audio baby monitors are rated high if users experience less interference and clearer sound quality. Video monitors are rated on sound and video quality and reviewers note dissatisfaction with monitors that don’t offer clear pictures and favor units offering good night-mode viewing. Features: The following features play a big role in consumer satisfaction: Adjustable cameras on video monitors that allow users to zoom, pan, and tilt are reviewed much higher; and LED light displays that light up on audio monitors to alert parents that their baby is making a sound is a valued feature, although units where the light is too bright and therefore disturbing to parents can be a product letdown. Range is an important consideration when choosing a baby monitor. For smaller distances in smaller homes, you can get away with a shorter range. For bigger homes where rooms are further away from each other, opt for a longer range to ensure you can monitor while in any room of the house or out in the yard. Baby monitors are available in a variety of frequencies: 49 MHz (entry level, good value monitors), 900 MHz (offering longer ranges), 1.9 GHZ (DECT monitors offering the least interference), and 2.4 GHz (middle of the range monitors). 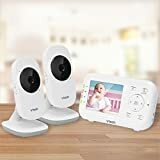 If you need maximum digital security, baby monitors that offer DECT (Digitally Enhanced Cordless Telecommunications) technology are your most secure option. When picking the size of your baby monitor, it is important to note that smaller the receiver is, the more portable it will be. Added features are worth considering. A low-battery indicator that lets you know when your batteries need to be changed or charged. A light that is activated by monitor sound means no concerns if you are in a busy (and loud) area of the house - the light will let you know if the monitor has detected noises. 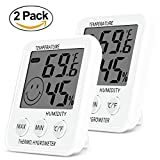 Temperature tracking is a great feature to consider if you want to make sure your baby room is the optimal temperature. And adjustable sensitivity settings will enable you to filter out the background noise so you can hear your baby more easily. A baby monitor set will include at least one transmitter and one receiver, however some will include two or more of each or at least allow you to buy extra. Multiple receivers mean you can leave them in one room and carry the other around or allocate one to each parent. Multiple transmitters allow parents to listen to and monitor more than one room at a time, sending the signal to one or more receivers - great for homes with two or more children. Cord or cordless? Video and audio quality is the same for both, and choosing between them is a matter of preference and budget. Cordless baby monitors offer much more freedom of movement allowing parents to use the monitor in different rooms of the house if needed. Corded monitors tend to be much better on the pocket. For corded baby monitors, make sure the cord is not placed within 3 feet of the crib for safety reasons. 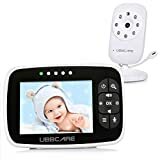 Wireless video monitors come with a variety of added features, including email notifications when there is movement in baby’s room and larger internal storage to store videos for longer. Audio monitoring is a perfect option for newborns that wake up and cry many times through the night as a way of alerting parents that they need attending to. Video monitoring helps you asses the cries you hear and their urgency. Sometimes babies wake up briefly before putting themselves back to sleep and a video monitor will help you asses this, preventing you from getting up necessarily. Infant Optics: Specializing exclusively in baby monitoring devices, Infant Optics’ aim is to provide quality monitoring devices that are affordable to American families. Enjoying the rank of #1 selling baby monitor on Amazon since 2012, they are a renowned, high quality brand. Motorola: A leader in the mobile communications industry, Motorola has been a top inventor and innovator and is responsible for inventing the first mobile phone. For 80 years they have built up a reputation as a quality brand and are a household name in monitors, smart phones, and other electrical devices. Levana Ayden: One of the first companies to pioneer video baby monitoring systems, Levana Ayden was formed in 2011 by parents, for parents. With their focus on keeping things simple and giving parents maximum peace of mind, their monitors continue to grow in popularity. Foscam: With their aim to bridge the gap between powerful capabilities, ease of use, and affordability, Foscam offers consumers high quality remote monitoring. Providing the best in wireless technologies, their products make quality tracking with modern technologies possible.